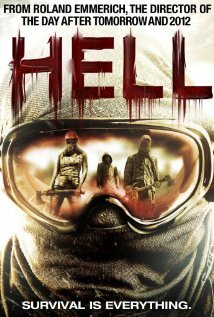 Popping the DVD of Hell (2011) on, I was pretty apprehensive. Not my usual apprehension putting a horror film on. Rather the apprehension came from the fact the cover of the disc heavily promotes the fact that Roland Emmerich was heavily involved in the film as producer. Whilst thankfully Hell manages to avoid being a piece of Emmerichian dross, I did have my issues with the end product. Set in 2016, the film is a sci-fi/horror hybrid that for the most part leans toward the first of those two genres. Setting it in the (very) near future worked well I thought, giving it an immediacy that is lacking in so many sci-fi flicks. The earth has been scorched by the sun for whatever reason, presumably global warming, that has seen the temperature skyrocket. What is left is a dystopian wasteland where very few have managed to survive. 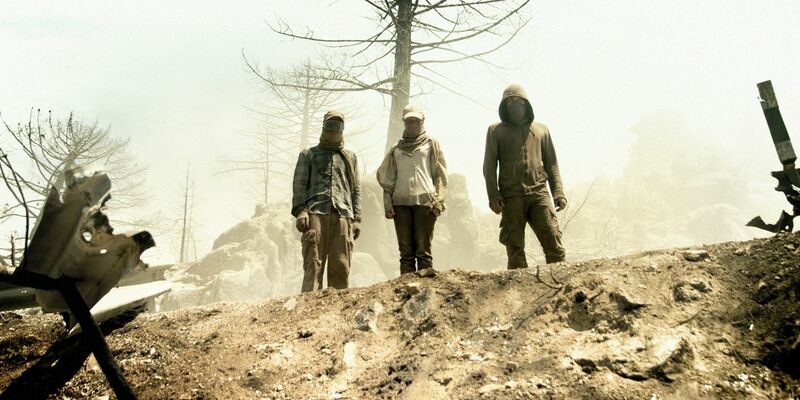 The film has a similar atmosphere to The Book of Eli (2010) and this connection is reinforced by the sun drenched visuals. The daytime exterior shots with the extreme, over the top lighting to convey the blaze of the sun look really great, and it is a visual tick that I think should have been utilised more throughout the film. A small group of young people are making there way through this environment, scratching together water where they can and petrol for their car. A lot of the early going sets up the dynamic between the various parties, which includes a set of sisters. When the younger of the two is kidnapped, the action turns into a tense attempt to first find then rescue her. Eventually the elder sister finds her way to a commune/farm where she appears to find comfort and security, as well as hopefully help with rescuing her younger sibling. It is a flat start in many ways. The film meanders along a little, with little tension and not too much audience connection with the characters being built up. Now my major issue with Hell (and I am going to veer into spoiler territory here) is that it is all set up and not enough meat. It is eventually revealed that the friendly farm folk that take in the main protagonist have actually resorted to cannibalism because there is nothing to eat. That is an awesome combo of sci-fi and horror in my book. But the reveal comes too late. So that all of the really cool narrative that comes after that is over far too quickly as precious screen time has been wasted building up too much detail that is ultimately just cast off in any case. The twist in the tale improves everything. The film automatically becomes more intense and atmospheric, you care more and interesting characters, such as a cannibal matriarch, start having a real effect on the action. It also does a good job of drawing out that age-old hypothetical of what, if anything, could lead you to eat your fellow man. Overall Hell suffers from being too slow and also being unbalanced. It spends a majority of the time on the least interesting aspect of the narrative, in turn short-changing us on the cannibalistic tastiness. Competently, though rarely inspiringly made, this film definitely fell short of what it could have been for me. I can’t say that Roland Emmerich is a household name for me, although I am familiar with some of his work, but on the plus side because of this review I looked through his filmography and found a cheesy 80s movie called Ghost Chase that looks to be just the thing for me to enjoy. Thanks! Nice! Glad I could lead you in the direction of some 80s cheese. I’ve been putting this off forever because I didn’t want to pay for it and it sounds like I’ve made the right decision. Thanks for this! Yeah I don’t think you are missing out on much. Don’t think you would get into it too much. That is even taking into account the healthy dash of cannibalism.